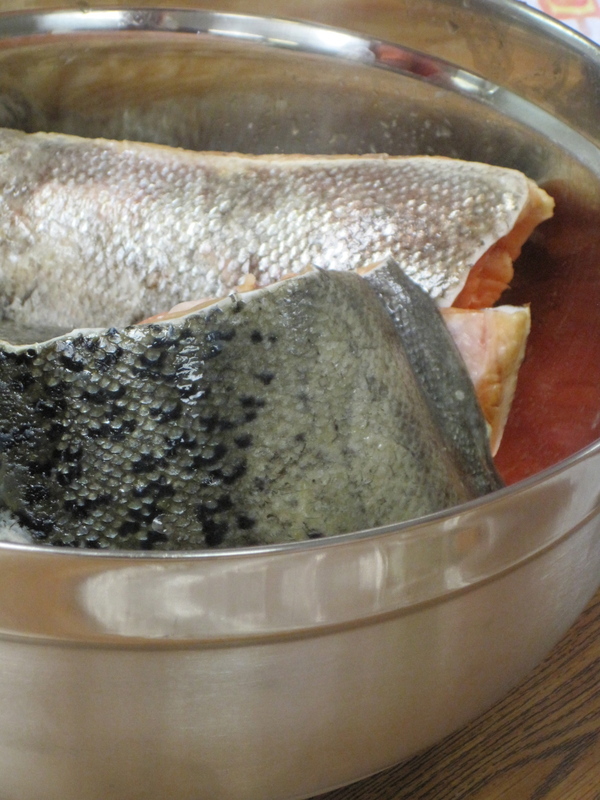 Above: Dale in action and salmon, before and after (or after and before, rather). 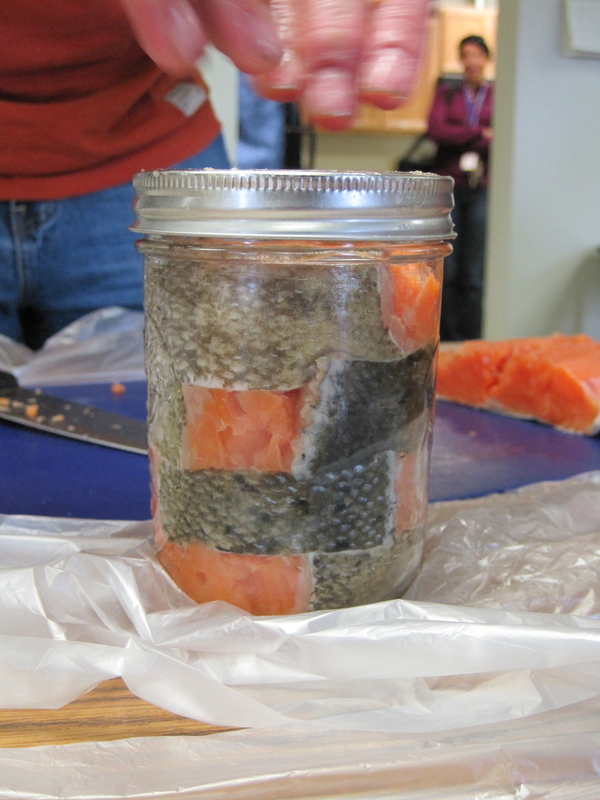 When salmon is canned with the skin on, it can be layered in the jar to make really lovely patterns. Some people made a checkerboard pattern, and others opted for their own creative designs. Someone commented that it looked almost like a snake coiled in the jar. 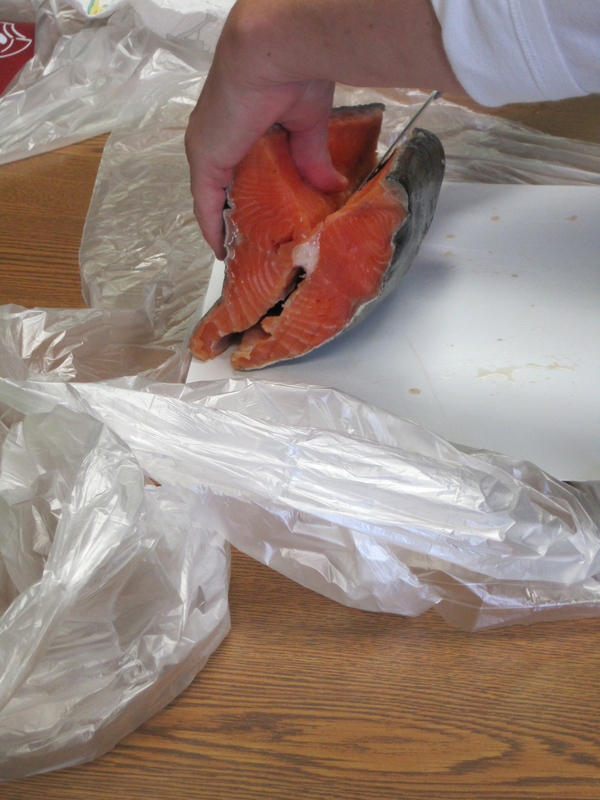 Leaving the skin on can be kind of a pain if you want to de-skin the salmon before serving it, but the skin provides healthy fat and flavor. 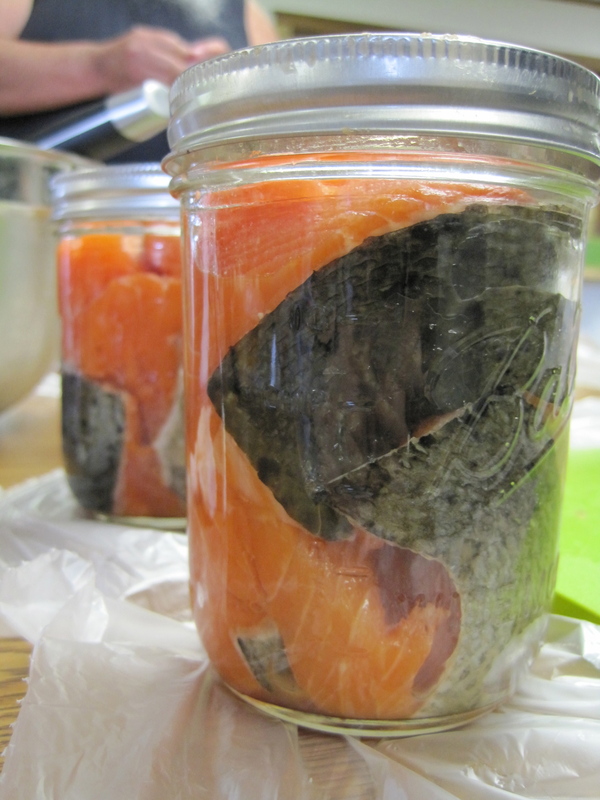 Salmon doesn’t need to be deboned before canning, as the pinbones dissolve and the spinal column turns soft and edible, providing lots of calcium. 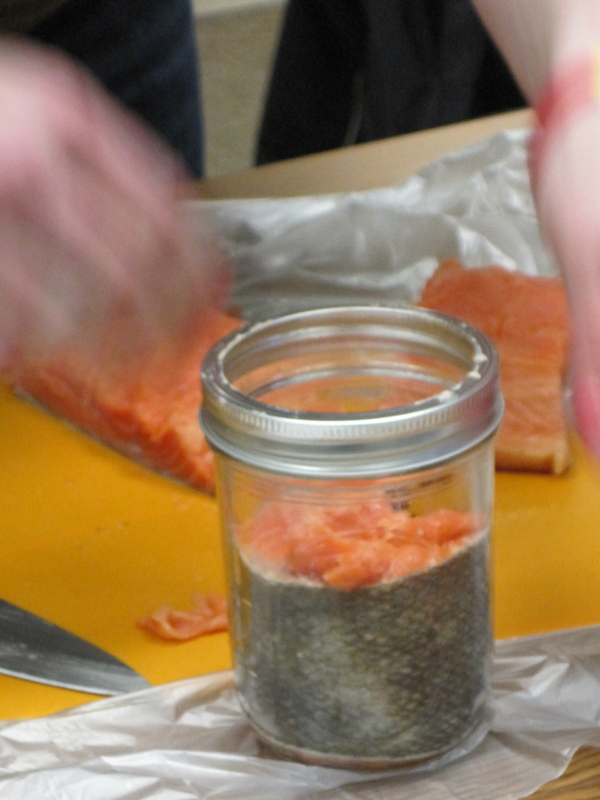 We left it up to the students to decide how they wanted to proceed, after learning how to fillet a hunk of salmon, for those interested in canning without the bones. Easy! 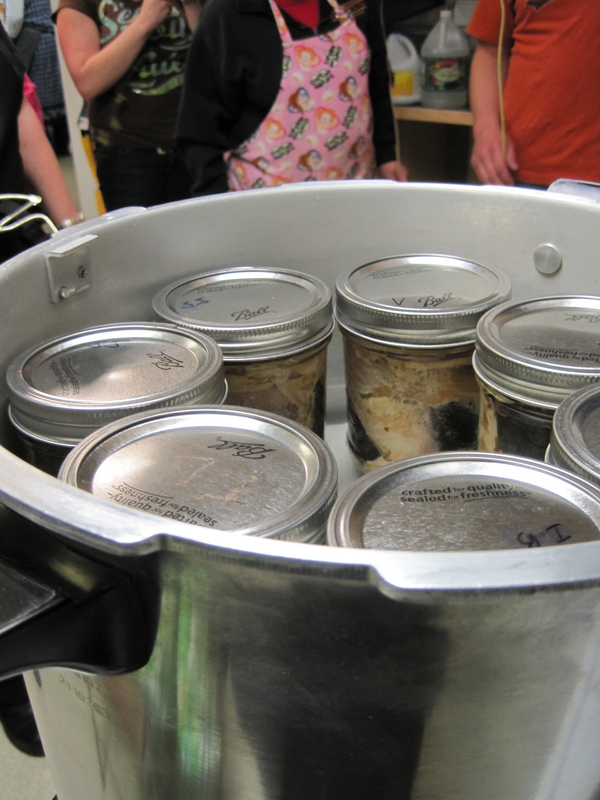 As far as canning classes go, it was probably the most plush gig I’ve taught at. 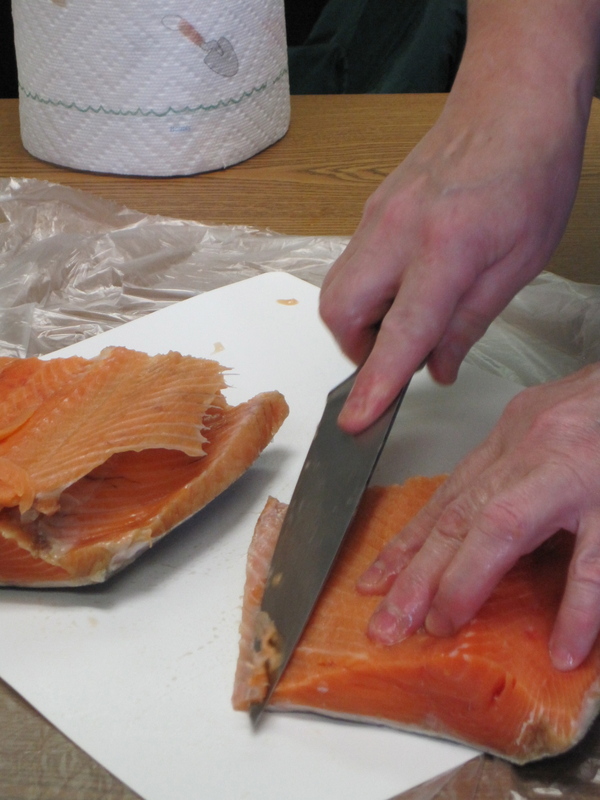 The organizer, Adrienne Crookes, had all the supplies arranged — from salmon to clean jars to cutting boards to newly sharpened knives — and she even taught the filleting process! She did quite a bit of work to make this event a success, and it showed. It’s always such a pleasure to be led by an organizational pro. 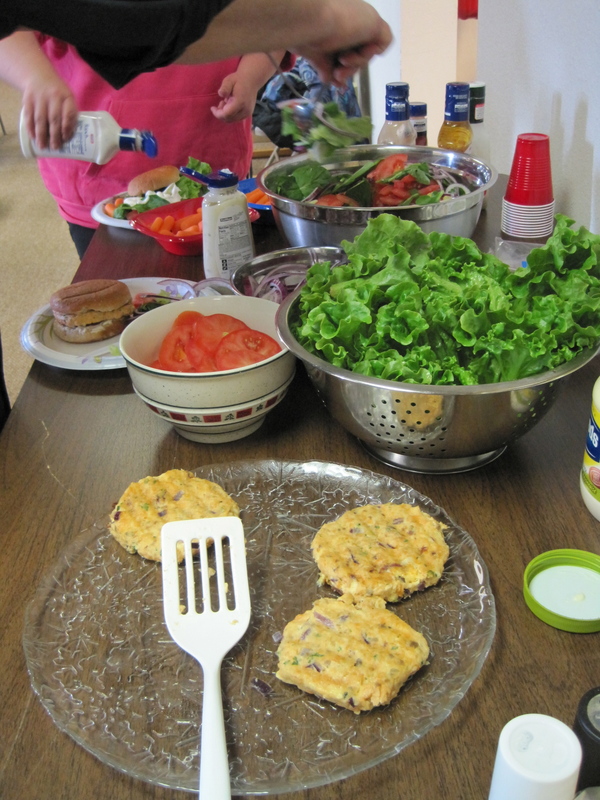 A lovely treat was a delicious lunch of salmon burgers made from previously canned fish, as we waited for the long processing to be completed. The burgers were seasoned with parsley, onion, garlic, and bound with mayo and egg. After lunch, we were joined by a project coordinator for health and cultural programming for the Federation, Sharla Robinson, who shared a presentation on native foods and reintegrating native plants into the diet. She stated that Native Americans are particularly susceptible to diabetes and by returning to a more traditional diet, the risk would be reduced. This is also suggested by a study cited in Michael Pollan’s In Defense of Food, in which diabetes rates plummeted for aboriginal tribes who switched from so-called Western diets high in sugar and refined grains to traditional patterns of eating and living. For the Siletz Federation, there has been great interest in educating youth at culture camps, but this year marks the first year food is included as part of culture, Sharla noted. From her poster, replete with photos of food gathering and preparation, I could see that preservation is a crucial aspect of educating new generations about food traditions. For example, eels are trapped among rocks at the bottom of waterfalls, then smoked like jerky so they’re available for year-round eating. Huckleberries, salmon berries (and manzanita berries (?!)) are collected for drying. 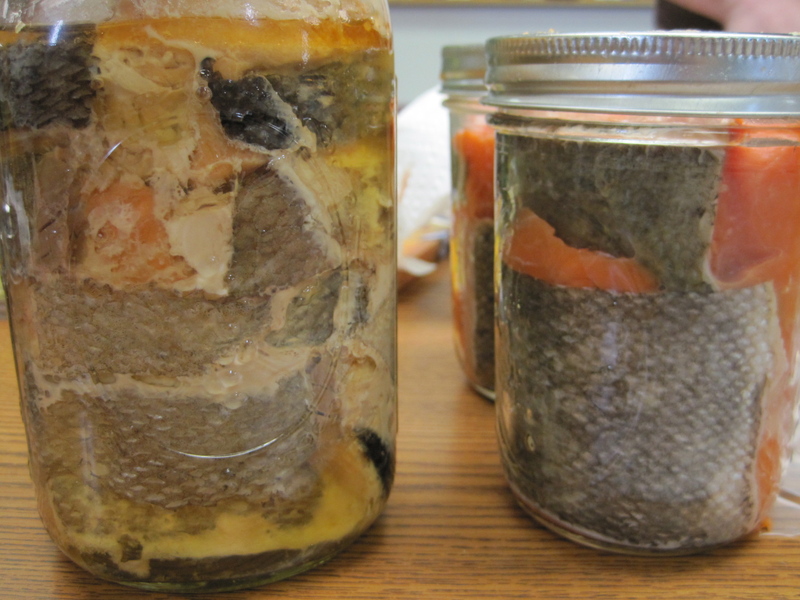 Fruits like plums, game meat, and fish can be canned. 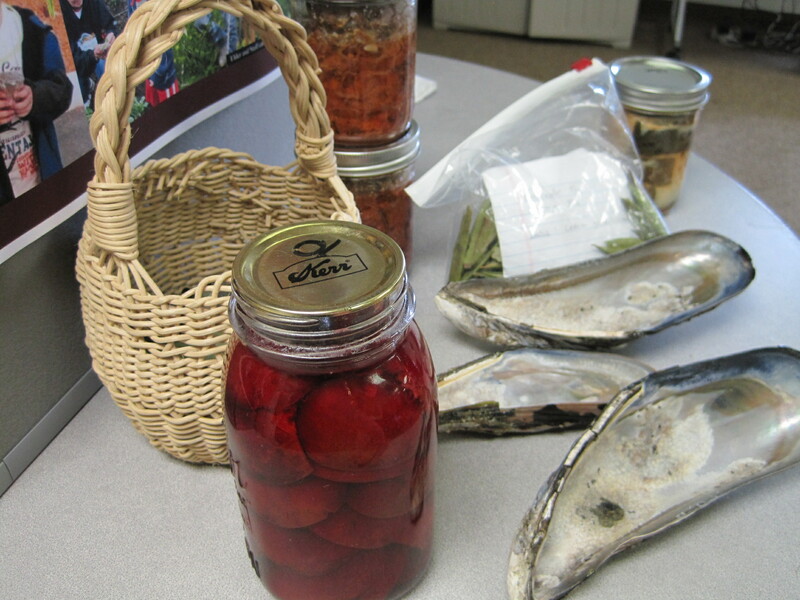 Pictured above are a lovely jar of beet-red plum halves, a basket of herbs, two jars of deer or elk stew meat, a baggie of what Sharla called “ocean tea” made of a local herb, canned salmon, and giant mussel shells. What’s ready for traditional projects now? Hazel branches! Sharla brought a large armful of switches that had been just cut, and the group of students were persuaded to help peel them for basket weavers. The Siletz Federation has a language teacher, Bud Lane, who teaches basket weaving. You can see one white peeled switch in the middle of the leafy pile. While they peeled, I graded exams. Party pooper, I know. But I did get to see some lovely photos of finished baskets and basket caps, used as part of the ceremonial regalia (thanks, Adrienne!). Soon enough, the jars were ready and we lifted them out of the canner. I think we had a 100% seal rate, which wasn’t too shabby at all for a first-time group. All the students were able to take home a couple of jars. It was a great group and really fun, plus I learned quite a bit about native flora, fauna, and people. Thanks, Siletz Confederated! I hope you have us back to teach more classes soon! 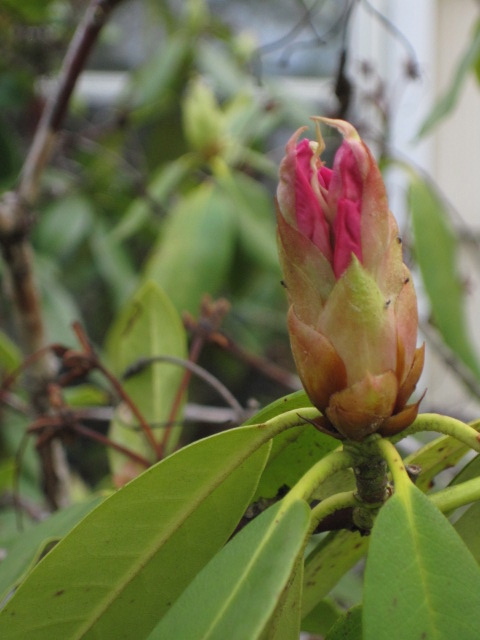 The rhododendrons are coming, are coming! This is the very first bloom on my rather ill-kempt, unidentified, monster shrub in the front yard. 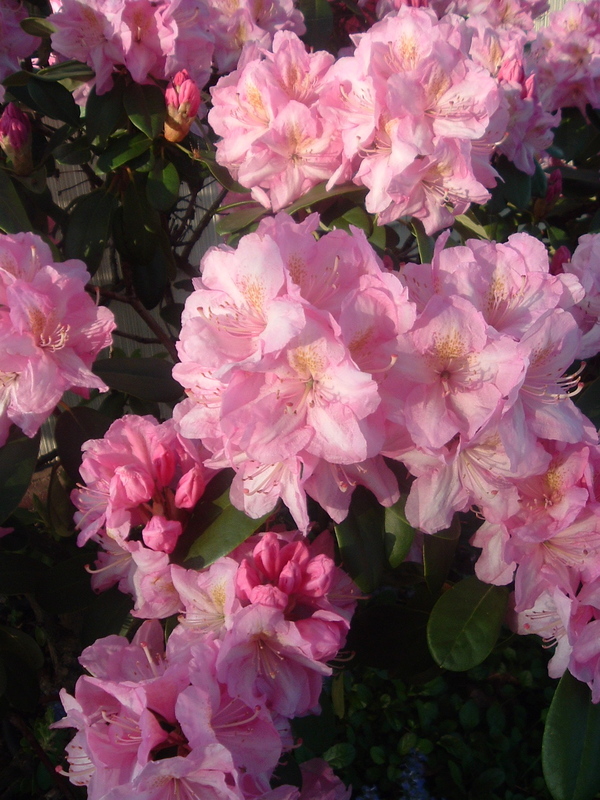 It has pale pink, star-shaped narrow blooms that fade in the sun, but the buds are pretty, at least. Looks like aphids are already congregating. I have three more bushes that are in better shape. The badly placed old ‘Virginia Richards’ in the back (below, from 2009), a salmon pink joy, is miraculously budded up after a year of dormancy and my best attempts to shade it. The two ‘Scintillation’ rhododendrons in the front, which put out giant garish pink puffballs with yellow middles (below, from last year), will have another vigorous year, I’m sure. Of all the extant landscaping, these two rhodys were the only thing planted properly. Thanks for making the only healthy plant the color of bubblegum, Previous Owners. 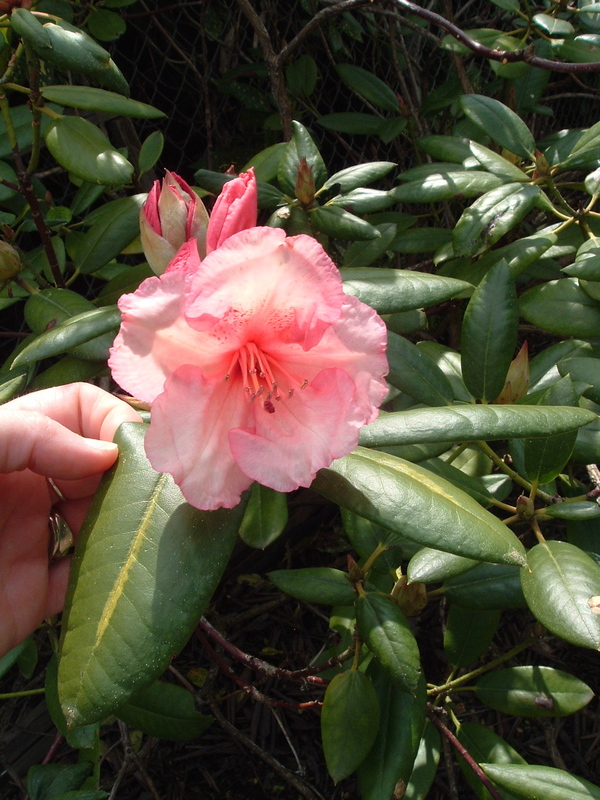 You should probably skip my house and go check out the amazing offerings at Hendricks Park, our 15-acre, rhododendron-filled oasis this weekend. Now my blog will get thousands of hits. Ha! But I mean garden weeds, and I believe I speak for every single gardener in this here town when I say three cheers for a sunny weekend (ignoring showers on Sunday)! 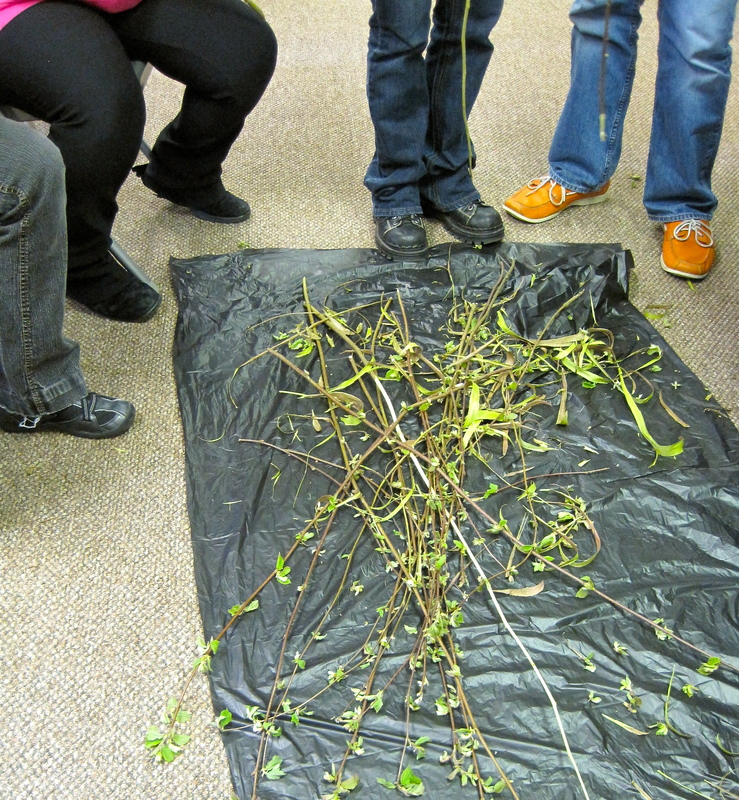 I spent hours weeding and seeding and pruning with my cohort. Most of the beds but the big one in front were tilled with compost, and ready to go. Everything looks pretty good for now. The lilacs should bloom this week, and the tulips are in full swing. Boris helped me by overseeing the process. 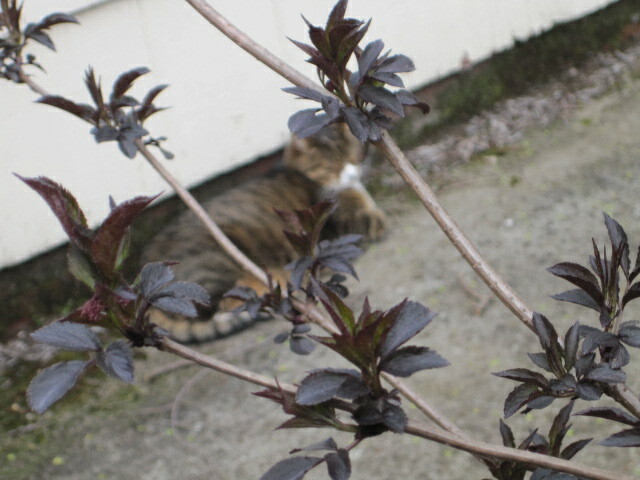 He models a Sambucus nigra ‘Black Beauty’, right. Elderberries to come! I really love this time of year. Guess it’s good that it’s raining again, or I’d want to be out there again today. Chag sameach, happy Passover, and all that. Yes, that’s a knob of ginger standing in for the shank bone. It’s brown and elongated, no? 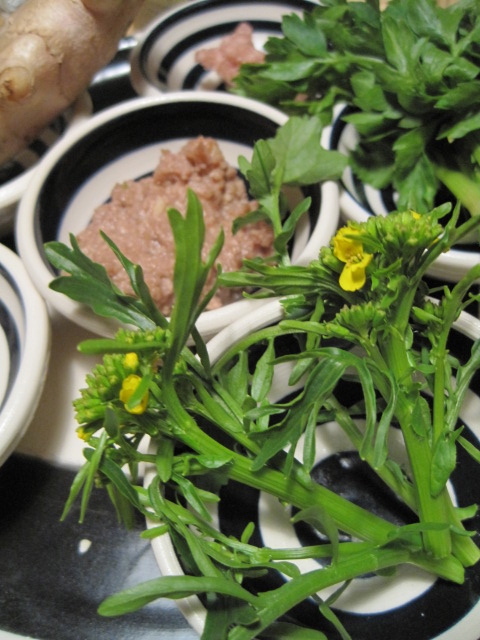 For bitterness, we have a slightly mauve maror, since I added a bit of pickled beet as filler to the hand-harvested horseradish, and arugula flowers. Karpas is from my healthy parsley crop. The haroset is a properly leaden mortar (oops). Still, not bad for a relatively quickly organized pseudoseder. 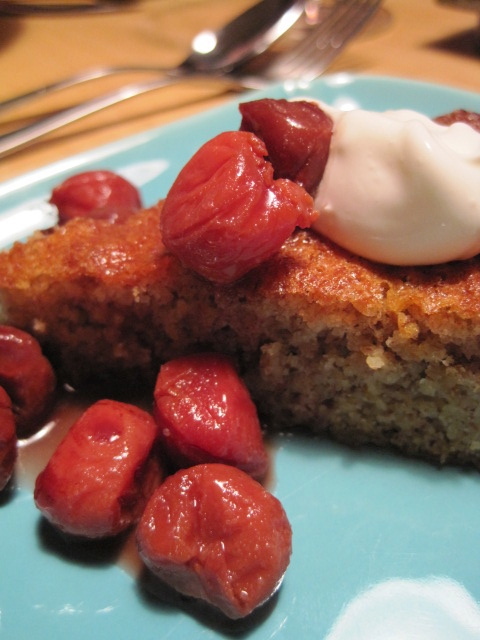 And my friend’s almond torte wasn’t bad at all, and not the least bit dry with a sauce made of last year’s frozen sour cherries. And yes, that’s a meat-based white dollop there. Shh. Don’t tell Elijah. Actually, this year was a little bittersweet. One year when we lived in a tiny house in Berkeley where the dining/living room opened up to the front porch, we opened up the door for Elijah at the appropriate time in the seder. And lo, there sat our beloved cat Sylvia, who made the grand entrance of her life, to the delighted exclamations of everyone present. This is the first year she hasn’t been with us in person, as she passed away in November. A little part of me thought she might be there when I opened the door this year. So indeed, she was. And will be next year, too. *why is it on this night only do we eat Hillel sandwiches? **why is it on this night only do we serve garbage fish from cans and jars to complement those delicious sandwiches? ***why is it on this night only do we gild the lily? ****why is it on this night only do non-practicing Jews omit the crème fraiche? So much to announce, and I just haven’t had the will to do it. Started this post three times today. Bad news, since it’s still freezing cold and wet and I have fullblown spring fever. So I’ll keep it short. Consider it the World Literature Survey of dining niblets from your favorite home town. – Japanese. Go to Kamitori on 11th and Willamette. It’s worth every (inexpensive) penny. Go especially if you’re into real Japanese food, not just chicken teriyaki, even if they do have that, too. And tell the chef how much you appreciate the authenticity (but it’s ok if you recommend axing the krab salad in the kaisen (left). I’m actually ready to come to blows if someone ruins this place. – Lebanese. 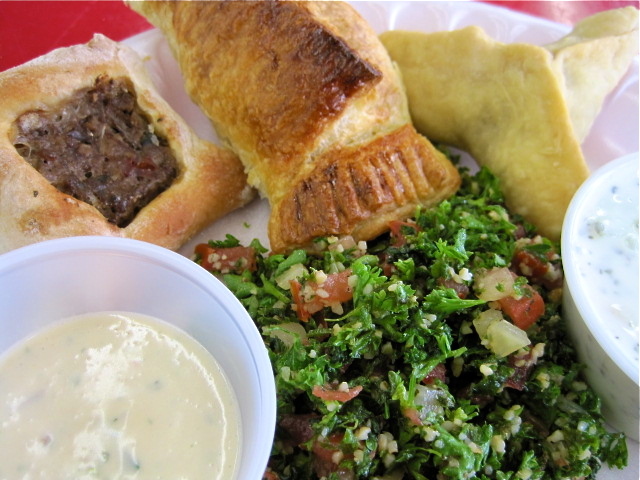 Go to the new Middle Eastern Deli at Plaza Latina on 7th a few blocks east of Chambers. She’s still working out the kinks and setting the menu and prices, so go and defend your favorites. I found the tabouli (top photo, with various pies, hummus and tahini) particularly good — the parsley is not smushed to soggy bits with a heavy knife and loaded down with bulgar wheat. Just as it should be. – Jewish. Tomorrow night starts Passover. Got my brisket in gear and am cooking it as we speak, a Joan Nathan recipe. I hope this is a good compromise between my two recipes, one called “Traditional (If Dull) Passover Brisket,” and the other one, “Cranberry Brisket,” which I love but has been vetoed by the no-fruit-with-meat half of my relationship. This half also absconded with one of the apples for the haroset, so I made apple-pear-haroset. Yeah, I know. But it’s supposed to be like mortar in texture and color, right? Right. 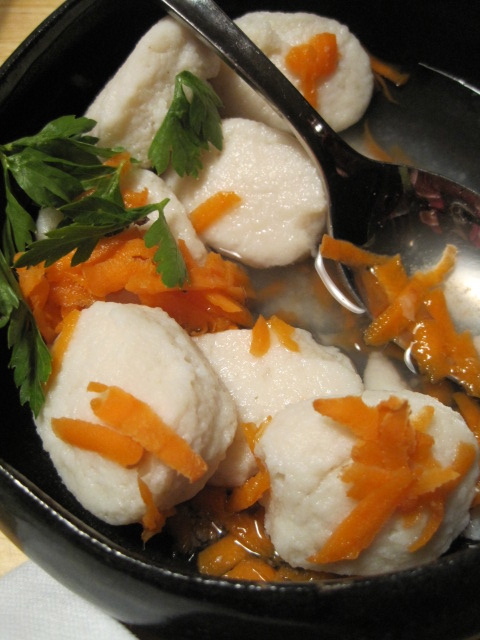 I’m glad to hear that Humble Beagle will be serving matzoh ball soup all week, since it’s the one thing we’re not making due to the hilariously quirky mismatched dietary profiles of my guests. – Thai. I perused the menu and spoke to someone who had the authority of an owner at Sabai, a new “Pacific Rim” or “Thai Fusion” restaurant in Oakway. I’ll be nice and just say these two terms make me shudder unlike any other. The good news is (at least for fans of the popular American-style Thai Ta Ra Rin restaurant), is that the menu is very similar to Ta Ra Rin. The authority figure told me that they were planning to introduce Indonesian dishes, which would indeed be a nice addition to our local ethnic cuisine. I’d just really like to see 1) serious attention to reducing the sweetness of all of the dishes if the menu is indeed based on Ta Ra Rin’s; and (2) offering non-sweet dishes with a vinegar or even just dry-fried, salt-and-pepper profile. All Americans don’t like Thai food that’s achingly sweet. Indonesian food can be way too sweet too, so it’s going to be a rough ride. – White. White flour, that is. 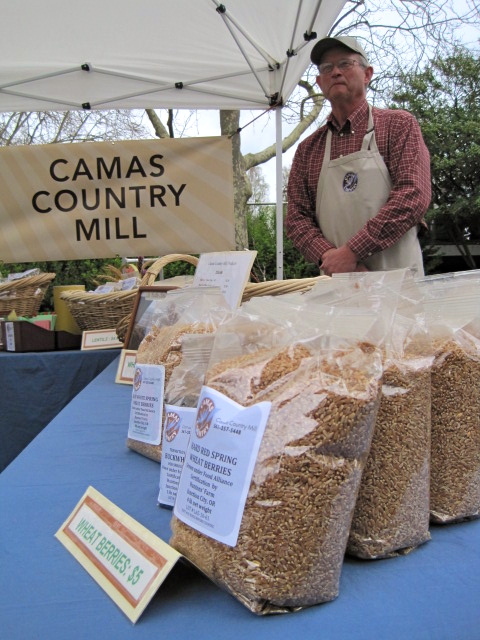 Excellent article about Tom Hunton (right, at the Saturday farmers market) and Camas Country Mill in the Register-Guard today. It discusses the mill engineering and Tom’s decision to diversify from grass crops to wheat and other grains, including teff. The article acknowledges the liberal-conservative partnerships that can (and need to) happen with food system changes, and shows how Tom’s making it work with his partners. Way to go, Diane Dietz! That was the best food reporting I’ve seen in the R-G in a while. So why was it in the Business section? – Mexican. Still loving taco night on Sundays and Mondays at Belly, and hope the owners have a good time scouting out new menu items on their vacation down south. The restaurant will be open only for taco nights this week. But a small grump: I am sad the tortillas are now being served cold instead of nicely griddled. Can we change that? I fully realize that after a couple of margaritas I don’t notice anymore but still. Shh. And kudos to Belly for being mentioned in visiting LA food critic Jonathan Gold’s twitter — he was in town for a UO School of Journalism award and said the tripe and trotters on toast gave him “a lot of happiness for $8.” I like a man who gets his cheap thrills in organ meats. – Polish. And speaking of organs, I bought my Easter kielbasa a couple of weeks ago at Benedetti’s Meat Market. Fresh kielbasa is always hard to find in Eugene, so go check ’em out. You can bet your dupa I’ll be making my Easter soup this year. Our cup overfloweth with fresh eggs, since the farm chickens have decided the weather be damned; it is spring! – Italian. But if you’re not in the mood for Polish Easter soup, check out Sfizio for their Umbrian regional dinner on Easter Sunday. I haven’t seen the menu, surely by some fault of my own, since they usually send ’em by now. But it’s a good option to staying home and eating too many Cadbury eggs and jelly beans. – Fermentation Nation. 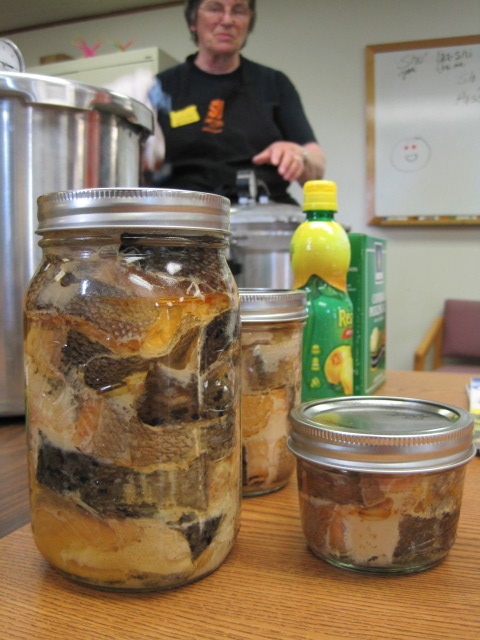 Thanks to everyone for coming out to the Master Food Preserver class on fermented foods. We had about three dozen attendees for the demo, and everyone was so enthusiastic and full of questions it really energized all of the teachers. We really had a great time discussing kefir, yogurt, kim chi, sauerkraut, cider vinegar, chocolate, and sourdough bread. The next class is on emergency planning and we’re offering a canning basics series this summer after the produce starts to come in to the market. We’ll be teaching pickling, jamming, water bath canning (with tomatoes), and pressure canning in four classes for $40 (see a full schedule of courses here). Yes, that’s $40 for four classes TOTAL, not each. We’re also starting to connect with other MFP programs nationwide on our Facebook page. Follow us and let us know what you’re interested in canning and cooking this summer! So how’s that for short? Don’t forget, I am a professor. We don’t do short. 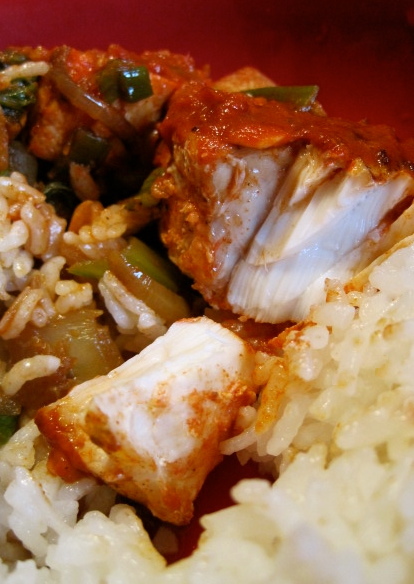 Mmm… grilled halibut in a kimchi juice marinade and sesame oil reduction, served with gingery bok choi. The ne plus ultra best way to use up the dregs of your homemade kimchi. Think about it. Spicy sour souse studded with garlic, ginger and green onion ? No brainer. My husband is crafty. He calls from the kitchen, “hey, I’ve got some fish!” and waits. I am laid out in bed with my feline sidekick, watching old Elvis Costello clips on YouTube, as I do when I’m utterly exhausted and searching the internet for reasons to endure. Then I think, hmmm, he’s going to ruin that fish by underseasoning it. He usually mutters something noncommittal about lemon juice. Then, with all the will in the world, I usually roll out of bed and straggle into the kitchen in a foul mood. Ah, but a mood that is elevated immediately by cooking. But I’m too tired and it doesn’t work this time. Another deft ploy. I am faced with the choice: Elvis Costello live in 1978 or decomposing bok choi that might meet a poor end in 2011. There is no choice. They call her Natasha when she looks like Elsie. 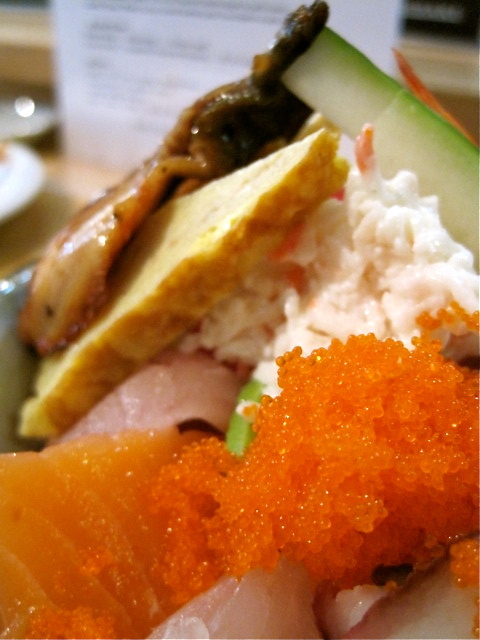 1) “Are you tired of American style Sushi?” asks Kamitori Sushi’s website. I am, indeed. They promise Japanese-style sushi and noodles — simple preparations, hardly any gimmicky toppings. Real bonito-and-kelp dashi broth for the noodles. Mackerel pressed sushi — I don’t think I’ve ever seen this on a menu in America. No mayonnaise crap with fifty kinds of fish deep fried and soused in teriyaki sauce. Eugene, this is big, big news. In fact, it might be the best restaurant news I’ve heard in years. 10th & Willamette. 2) Green gumbo, potted chicken, kale chips and more at Party Cart, the newest food cart in town. Three people in the food industry gushed about it this morning after its opening last night. Run by a baker and a cook: a food cart marriage made in heaven. I don’t think they have a website yet, so here’s the Facebook. 28th & Friendly, in the Healthy Pet lot.